Panorama Hilltop (パノラマ台, panoramadai) is a mountain located between Lake Motosu and Lake Shoji. The altitude of the summit is 1325m and it has great view of Mt. Fuji and panorama view of north side of Mt. Fuji including Lake Motosu and Lake Shoji. There are two entrances to the summit, from lake Shoji and from lake Motosu. Both entrance has bus stop, but very few buses stop there. There is parking on lake Shoji side. 1. use Fujikyu Bus to Panoramadai. It takes 1hr. to the summit from both side of the entrance. Mt. Eboshi which is another view point of Mt. 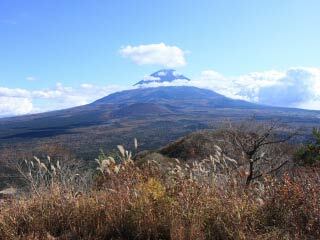 Fuji is located on the way from Lake Motosu. It is 1257m high.